There was a fresh photograph on Pauline’s wall. And it meant the world to her. She may have lost the relationship she once had with her mother, but she finally had a father. The last few days had been amazing. Granted, Candy was not sure how to take the news at first, but ultimately she’d decided to try to put the past behind her. After all, she and Paolo had been through enough already. So she gave him space to get to know his newfound daughter during their visit in Newcrest. And even now, when they’d left back for Windenburg, Pauline couldn’t wipe the smile off her face. It seemed that everything was finally as it should be. And she had Peyton to thank for that. “Cannoli and a latte, times two?” The barista smiled. “You know us too well, Clare,” Peyton confirmed. Breakfast at Monty’s Goodies on Sundays has become the sisters’ tradition. “I don’t know what you’re talking about,” Pauline blushed. “Oh come on, did you forget that he legitimately likes you?” Peyton giggled. Pauline wanted to change the subject. Luckily for her, the sisters were approached by a newcomer. “That seems to be a trend,” Peyton giggled. “What do you mean?” Pauline looked at Cygnus. “Do you really believe that?” Cygnus gave her a funny look. “I want to,” Pauline sighed. “You’re a wise man,” Peyton agreed. “Hey, calm down, bro,” Caleb tried to interject. Her own words kept replaying in her head on her way home. Was she a hypocrite for not taking her own advice? Before she could answer the question, her eyes rested on a very upset looking Leo. Of course she was being a hypocrite. The poor guy outright said he liked her, and yet she still doubted it and refused to give him a chance. She’d been avoiding him ever since that day at the Garden of Eden Gym and Spa. Oh, plum it, Pauline decided. “Hi Leo, long time no see,” she approached him energetically. “I was just thinking that,” he gave her a sad puppy smile. What have you really got to lose, Pauline asked herself. She didn’t even wait to see what his response was, and just strutted off with newfound confidence. Leo’s enthusiastic cheer gave her all the answers she needed. Perhaps she should take her own advice more often. Because people were worth being given a chance. Oh, this chapter is so perfect! Love that final screenshot! 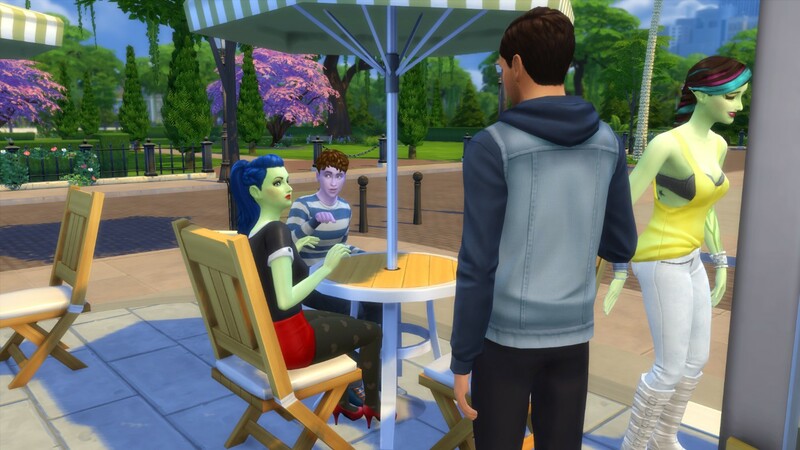 The human-alien relations were so fun to explore this generation! As for Pauline and leo, the ball was in her court for sure!